Gardai tackling bicycle theft arrested 33 people and secured over 20 convictions last month. The arrests were made as part of Operation Spoke, which last came into effect in central Dublin on February 11 and 12. The 33 arrests resulted in 39 charges and 21 convictions, according to the minister for justice Alan Shatter. “I am informed by the Garda authorities that Operation Spoke is an operation conducted within the Bridewell Garda District for specific periods of time on an ongoing basis. It was last put into effect on 11 and 12 February, 2014. I am further informed that Operation Spoke has resulted in 33 arrests resulting in 39 charges and 21 convictions,” said minister Shatter in a written Dail reply. The Dail reply was to a question asked by Tommy Broughan, a Labour TD for Dublin North East. Good to know that they are catching some of the Thief’s,it is a good deterrent that if they think they will be caught they will think twice about it. Congratulations to the Gardai for this effort to tackle bicycle crime. 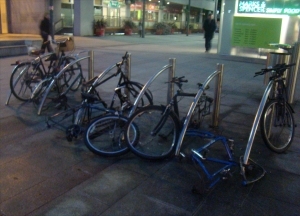 We could certainly do with something like this in Fingal where there is serious bike theft at train stations.